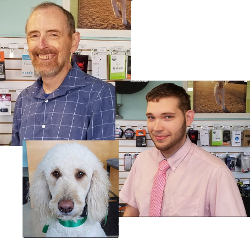 Clockwise from top left, we have owner Arthur Bruno, store manager Dustin Whittemore, and mascot Bonnie Hope! Call us at 479.253.0066. We love answering the phone! We’re open from 10:00 to 5:00 weekdays, and 10:00 to 2:00 on Saturday. And be sure to connect with us on Facebook to learn about specials and the latest new technology!